This is especially for parents with preschool children and older. Every parent wants their child to do well in school. We want our children to read as soon as possible and to love learning. We know the importance of a good start to education. So let’s explore some things you can do to help your child develop a good vocabulary and use of language. Read to your children often. Read stories they enjoy. And read books above their reading level about subjects they are interested in. 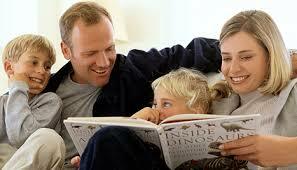 If your son is fascinated by dinosaurs, don’t just read children’s books with dinosaurs. Find books and articles that teach more about them than they would be able to learn on their own. Play word games. Driving in the car, waiting in line, and instead of a computer game, play guessing games. Challenge them to describe something of their choice. Ask questions about its use, parts, color, size, shape, what it is made of, what other things go with it, and its category. Then change roles and let your child ask the questions and guess. Listen to your child tell a story. This may be the hardest thing you do all day with your child! Some children can talk your arm and leg off! But listen and ask questions. Push them to explain how it could be done differently. If your child doesn’t easily tell what they are thinking about, ask questions they cannot answer with a nod or one word. Encourage conversation. She may be shy or she may be afraid to say something wrong. Reward her attempts with extra time and attention from you. Memory Games. You can start with rhymes or song lyrics. Grocery lists and steps in a process are all things we all must learn to remember. Memory will go a long way to helping your child in school. Retelling stories with the details in order is another way to help retention of facts. Fifty Cent Words. Kids love to learn a big, adult-like word for simple things. You can share a Fifty Cent word every day with your child and encourage them to use it in a sentence. Or let them choose a word that they would like to learn a Fifty Cent synonym for. We taught our toddler ‘umbilicus’ for ‘belly button.’ He loved to show off his Fifty Cent words and would try to insert them into conversations. Words have always been fascinating to him and helped him learn new vocabulary at school easily.